You’ve heard about how the three R’s – reading, writing and arithmetic – are crucial to success. But are we forgetting memory? A recent online survey conducted by NMI Research and DSM Nutritional Products asked more than 1,000 participants working in eight professional fields as well as students and retired persons to rank eight skills often used in their everyday tasks: mathematical, memory, organizational, people (interpersonal), physical strength/stamina, problem solving, technical and verbal. Memory was ranked as the top skill among three of the populations surveyed: medical (non doctor), skilled laborer and retired. Overall, 84 percent of all surveyed ranked “memory” as the third most important skill, behind problem solving (85 percent) and organizational skills (87 percent). How important is memory in your occupation? 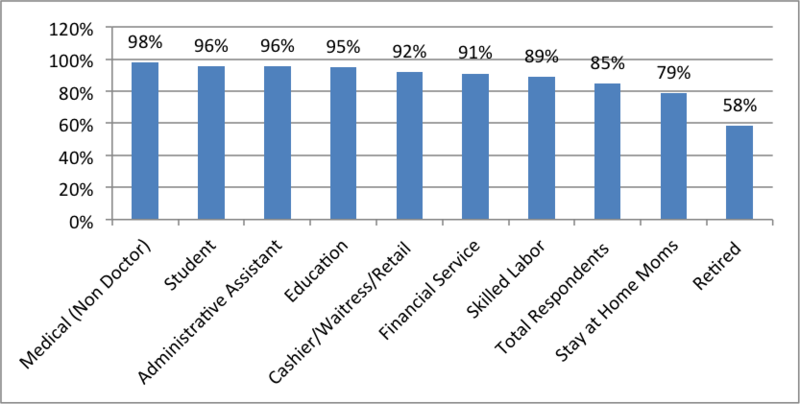 The following chart represents percentage of survey respondents who ranked memory as important or very important. This chart represents percentage of survey respondents who ranked memory as important or very important. Let us know how you rank memory in your line of work.